End of the freight tracks, Connellsville, PA. From left to right: Brendan O’Byrne, Guillermo Cervera, Sebastian Junger and Rudy Valdez. Photo by Mariah Rehmet, courtesy of HBO. War does not simply shape, shepherd, and injure bodies, or mold and undermine psyches in a unidirectional fashion. Through countless contradictory and incomplete processes, war excites bodies, cultivates capacities, gives value to things, provokes subjective interpretations of surprising behaviors, and forms connections. The first things I noticed about Sebastian Junger were his striking good looks, the bit of swagger in his walk, the strong jaw and those Paul Newmanesque blue eyes. I had arranged a late September date so we could meet and get to know something about one another before taking the stage together at the US premiere of his new war documentary, The Last Patrol. The screening was less than a month away, on opening night of the American Museum of Natural History’s Margaret Mead Film Festival, established in honor of the famous anthropologist who early on advocated using film in ethnography. I imagine the festival organizers were thrilled to land The Last Patrol, an HBO documentary and the latest in Junger’s long list of film, journalism and literary accomplishments that include the Academy-award-nominated Restrepo, the New York Times bestseller book and hit movie The Perfect Storm and the National Magazine Award-winning “The Forensics of War,” an article about the killing fields of Kosovo during the 1990s published in Vanity Fair (1). I know I was thrilled. I’d serve as interlocutor, which meant I would get to ask questions about filmmaking and ethnography, about war and the United States of America, about the boy-soldiers who are the subjects of Junger’s war documentaries and about the aftermaths of war for these combat vets and the journalist who has been following them since June 2007. That first meeting in September—over coffee and a bite to eat—went well, I thought. We talked about anthropology (his college major at Wesleyan), his coming of age in suburban America, women in the military, his search for meaning in masculinity, and his father—a German, half-Jewish exile. Junger impressed me as tough and tender, at once fixed in his beliefs even as he is open and vulnerable and accessible. I liked him and looked forward to our next encounter, onstage at the festival, on Thursday evening, the 23rd of October. Brendan O’Byrne displays his coat-of-arms tattoo. Photo by Guillermo Cervera, courtesy of HBO. 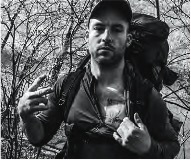 The Last Patrol features four guys and a dog on a self-imposed journey into vagrancy and a rough 300-mile walk alongside the Amtrak rail line between Washington, DC, and Pennsylvania. The film honors Tim Hetherington, Junger’s dear friend and fellow war journalist–cinematographer who was killed on the job in 2011. The two buddies had planned to take the long walk; after Tim’s death, Junger made it happen, arranging the trek with combat vets Brendan O’Byrne and Dave Roels, war photographer Guillermo Cerveras, cinematographer Rudy Valdez and a faithful dog named Daisy. The viewer follows the small group, burdened with heavy packs and limited equipment, as they make their illicit way along the tracks, talking about and reflecting on their war experiences and what anthropologists Sarah Hautzinger and Jean Scandlyn call “homefront struggles” (2). In this film, viewers also glimpse a larger set of homefront struggles in streets, churches, and homes across a small segment of the country. Junger, the journalist, has a question for the Americans they meet along the way: “What’s best about America?” More often than not, the responses are at once revealing and painful. In this and Junger’s other war documentaries, there are ethnographic elements—his films engage participant-observation and involve estrangement whether the setting is on unfamiliar or familiar turf. Like an anthropologist, Junger’s approach seems exploratory, his mission to seek the voices, perspectives and worldviews of those with whom he engages in the field. I wonder how he handles the tensions in those multiple roles—as an observer, a listener, a participant, a talker, a director and a producer of such a film. Of course, there are lines that differentiate documentary from ethnography; elements in The Last Patrol make these clear. Generally, anthropologists do not create the settings where the actions take place, but enter fieldsites that already exist. In the case of The Last Patrol, Junger crafted the setting in which the action occurred, the conversations were held and certain emotions surfaced. In that way, the walk along the tracks is an artifice. Beyond the promise and tribute to Tim, I wonder what motivated Junger in this choice. Did he have expectations about what might happen? If so, were these fulfilled? In some ways, The Last Patrol reads like fieldnotes, the raw data that has yet to be analyzed. Some might critique the film as superficial because it touches the surface of critically important issues without explicating them. At its heart, the film reveals how war gives the young men portrayed in it what life outside does not: the deepest feelings of intimacy, community and camaraderie; a real sense of purpose, of usefulness; a role in society and a place of belonging, aspects touched on in the epigraph to this essay. Some may want combat vets to have a certain consciousness about what they are doing or how they’ve been played, like Rory Fanning, a conscientious objector and former Army Ranger with two tours of duty in Afghanistan under his belt, who also walked across America (3). Viewers don’t get that in The Last Patrol. Instead, the audience sees the young men–boy combat vets in a raw state—fragile and strong, wounded and wise—dwelling in a world they did not create, a world of choiceless choices. There is so much to mine in this 86-minute film. What makes returning home from war so disappointing? What makes the homefront so alienating? How do gender values figure into how these men think and what they do? How do these and other cultural values get inculcated, harnessed and exploited in the service of ubiquitous war? The Last Patrol raises more questions than it answers, offering the possibility for deeper conversation and for discovering a growing body of social-science literature on war that includes: Kenneth MacLeish’s Making War at Fort Hood: Life and Uncertainty in a Military Community; Catherine Lutz’s Homefront and her “Making War at Home in the US: Militarization and the Current Crisis”; Cynthia Enloe’s Nimo’s War, Emma’s War; The Network of Concerned Anthropologists’ The Counter- Counterinsurgency Manual; and R. Brian Ferguson’s The State, Identity and Violence: Political Disintegration in the Post–Cold War World and his “Ten Points on War” (4). In The Last Patrol, those Americans the small group meets along their journey tell Junger that “freedom” is what is best about the country. This too is presented in raw form, leaving viewers to wonder: what does “freedom” really mean and why do Americans from different walks of life so frequently invoke it? The response is startling in light of the film’s vivid portrait of America as alienating and impoverishing and of Americans as lonely. Considering the fetters that hem people in, there is a certain sad irony to the response. It is also revealing: is there nothing else they can come up with that is “best about America”? 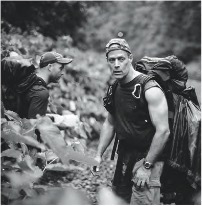 Sebastian Junger with Brendan O’Byrne in the background on their journey. Photo by Guillermo Cervera, courtesy of HBO. Opening night at the museum was spectacular, with hundreds of people filling the Lefrak Theater at the museum on Manhattan’s West Side. It turned out that Junger and I were joined onstage by Brendan, the combat vet, and Guillermo, the photographer. That made the conversation seem too short, although we did get the chance to touch on some tough topics, such as the affective experience of war and its aftermaths, and what’s wrong with the United States. It was also an opportunity to learn more about the three men and their lives. Afterwards, I picked up some chatter. The reviews were mixed: some appreciated the openness and honesty of the men in the film; others found their bluntness off-putting. In my view, The Last Patrol is a moving, disturbing, enlightening, funny, enraging and ultimately a very sad commentary on the state of the nation and the world, which is what I shared with Junger on stage at the opening night of the Mead Festival. In the film, war comes across as perhaps the most viable of alternatives for some kind of “fulfilling” life, especially for those who may dread the dim prospects the future seems to hold. It also provides one of the few avenues through which they can receive affirmation and appreciation from others. In an essay that serves as a powerful complement to The Last Patrol, Fanning calls this kind of affirmation “blind celebration” (5). Brendan, the film’s young combat vet now struggling with the wounds of war, offered a raw truth. “The enemy was a bunch of young guys shooting at us,” he explained. “And we were a bunch of young guys shooting at them. And it was older people who put us there,” he said. Like The Last Patrol, Brendan’s words are a brilliant starting point for a conversation that the country—and the world—so desperately needs to have. I have worked as a journalist for two decades, most of it covering civil wars that the United States was not involved in. I went from Bosnia in the early 1990s to Afghanistan in 1996, and then on to Kosovo and the horrific civil wars of Liberia and Sierra Leone. As an East Coast liberal who grew up during Vietnam, pacifism was very much part of my political DNA, and I never had any interest in covering the American misadventures in Iraq in 1991 or in 2003. Afghanistan was a different story, however. It was a country I’d spent considerable time in during the 1990s, and after New York and Washington were attacked by Al Qaeda in 2001, I intuitively understood the moral and strategic imperatives of trying to capture or kill the people who organized and carried out those attacks. In addition, Afghanistan had suffered terribly during its civil war of the previous decade, and I hoped that—as in every other civil war I had covered—intervention by NATO countries could reduce the civilian death toll. (In fact, Afghan civilian casualties have dropped fivefold in the decade following NATO actions in Afghanistan and, according to Afghan humanitarian groups, around 90 percent of those casualties are now caused by Taliban attacks.) The United States easily pushed the Taliban out of Kabul in late 2001, but after that, the Bush/Cheney administration started bungling the war so badly that it almost seemed like they were doing it on purpose. As the war dragged on and US forces got more and more bogged down, I decided to follow one platoon for an entire deployment. From that was born a body of work that, as I saw it, would demonstrate the experience of combat for young men. The final component of this project, The Last Patrol, would document the common struggle that many of these men face when they come home. I bring this up because Alisse Waterston, in her very positive review of my film, asks whether American soldiers give any thought to the enemy they are fighting, and to what their own role—as men—might be in a world where war is “ubiquitous.” In fact, the vast majority of countries in the world live in peace and, as documented by Harvard scientist Steven Pinker, civilian casualties from violence have declined dramatically since the Neolithic. Nevertheless, the premise of the question seems to be that the war in Afghanistan is categorically and obviously wrong, and that our young soldiers should hold some sort of informal referendum on the merits of the war and presumably decide—on the basis of that referendum— whether or not to go along with it. I hope the perils of that idea are obvious and that people realize that the decision to wage war falls squarely upon Congress and the president and not on Marines at remote outposts. If the military is allowed to choose which foreign policy directives to enforce, the United States will effectively become a military dictatorship, and then God help us. Furthermore, it is hard not to notice Waterston’s use of “boy soldiers” and “boy-men” to describe the soldiers I was with. The implication, I have to assume, is that these sol- diers are so young that they effectively are victims of our national policy and that mature men would never allow themselves to be exploited in such a way. As anthropologists well know, a person’s idea of him- or herself is crucial to understanding the social systems he or she is engaged in. I don’t know if Ms. Waterston knows any soldiers personally, but I can assure her that they do not self-identify as boys or—more crucially—as victims. Most of the soldiers I know are in their 20s and seem far more mature than their civilian peers. Furthermore, it should be noted that industrial society asks many people—mostly young, working-class males—to perform jobs that both cause enormous harm to our world and regularly kill them. Oilrig workers, commercial fishermen, loggers and many others endure mortality rates that easily rival that of all but the most forward-positioned infantry units. And yet no one thinks to ask these young men how their concepts of gender get “inculcated, harnessed and exploited” in the service of environmental degradation. This bizarre bias in our perceptions of war—and industry—leads to laughable ironies, such as the “No Blood For Oil” bumper sticker I spotted on a huge, gas-guzzling SUV in the vacation town of Truro, Massachusetts, in the summer of 2003. Gender seems to be an important component of Ms. Waterston’s experience of my film, and I have to begin tackling that complex topic by admitting that I have no idea what her term “gender values” refers to. I assume it is connected to the ideals of equality that many of us share. Equality and identicality are not the same thing, however, and it is obvious that both American society and Ms. Waterston herself acknowledge and accept different norms for men and women. I would refer to her extremely flattering description of me in the first paragraph as a case in point. (Let me just say that, at age 52, I cravenly take such compliments pretty much wherever I can get them.) Nevertheless, I would be doing a disservice to this discussion if I failed to point out that a male academic describing a female filmmaker in such physical terms would create a great hue-and-cry. Clearly, men and women occupy slightly different spaces in Ms. Waterston’s mind, and from those unconscious distinctions, gender roles are born. One cannot write about war without writing about the enemy, and it is true that at the tactical level—in other words, in the ridge-line-to-ridgeline fighting that the platoon I documented was engaged in—most of the enemy were young Afghans who undoubtedly had much in common with the American soldiers I was with. The irony implicit in that is too obvious to point out. However, the “enemy” also included men who executed a fourteen-year-old boy and his grandfather because they had found desperately needed work at the American base. Taliban fighters cut their throats and dumped their bodies by the side of the road. It is important not to let a desire to see common humanity in our enemies obscure the very real war crimes that characterized the Taliban regime both before and after the attacks of September 11. Finally there is the question of the United States. We walked through three hundred miles of this country, and my overriding impression is that it is gravely divided by both race and income. Soldiers experience a profound unity of purpose in combat, and one of the things that makes their homecoming problematic is that they fought for a nation that does not understand how to function that way back home. One of the most moving footnotes to that problem, however, is the response that we got to our question, “What is the best thing about America?” In rich communities, people generally declared America to be the “land of opportunity,” but in the poorest communities, people invariably answered “freedom”—specifically, freedom of speech, of religion and of assembly. As Thomas Paine well knew, all social good flows from that concept, and I find it quite moving that even poor people in this country understand freedom to be the basic building block of a just society. Obviously, we have a long way to go, but overlooking “freedom” as one of our greatest accomplishments does not betray ignorance among the ranks of the poor. It betrays a profound lack of appreciation among the ranks of the rich. I consider this conversation an example of the larger effort in anthropology to dialogue with people outside the discipline. It has turned out to be a very interesting and revealing exercise because of the way Sebastian Junger and I agreed to be open to what the other might say, and to do so in a very public way. For me, it has felt a bit risky. I think the exchange has helped reveal deeper aspects of the issues at hand, our assumptions and perspectives and the great value of anthropology for understanding and interpreting the world. I respect Junger’s work as a journalist and appreciate the eyewitness accounts he offers. His approach, revealed in how he summarizes his two decades of war reporting, is fixed on what is readily apparent. For anthropologists, the ethnographically visible— what they see on the ground—is the starting point as well. The discipline then requires anthropologists to problematize everyday observation, “common sense” and “intuitive response,” which can be deceptive. Anthropologists seek to analyze deeper and longer histories and the multiple, broader contexts for war and other social phenomena, including local and global political economic processes (6). I appreciate that Junger queries my own assumptions. In terms of the question I posed about “the enemy,” the actual premise is not exactly how Junger frames it. Instead, it relates to my understanding of a consistent pattern across wars: participants are pressed into service by means of a mobilization process where lines are drawn, potent language is used, groups are demonized and dehumanized, justification is put on spectacular display, duty is summoned, virtue invoked and trophies bestowed. It is calculating, but as war scholar R. Brian Ferguson notes, “… [it is] not just manipulation. The values are true to local culture” (7). As Ferguson teaches, “Once a given society is internally adapted for war, making war becomes much easier—a necessity, even, for the reproduction of existing social relations” (8). In a world internally adapted for it, war becomes ubiquitous. It may be comforting to believe Steven Pinker’s contested conclusions (9). Anthropologist Catherine Lutz argues that Americans live in “the military normal” (10). If so, the responsibility as citizens of the world to question and critically assess any call to arms is even more urgent. My point is not to cast aspersions on the young men who would go to war. The critique I offer is in solidarity with them. It is also in keeping with Junger’s own suggestion that their position is part of a broader class struggle, a great place from which to continue this conversation. (1) The Last Patrol aired on HBO on November 10, 2014. (2) Sarah Hautzinger and Jean Scandlyn, Beyond Post-Traumatic Stress: Homefront Struggles with the Wars on Terror (Walnut Creek, Califor- nia: Left Coast Press, 2013). (3) Rory Fanning, Worth Fighting For: An Army Ranger’s Journey Out of the Military and Across America (Chicago: Haymarket Books, 2014). (4) Kenneth T. MacLeish, Making War at Fort Hood: Life and Uncertainty in a Military Community (Princeton: Princeton University Press, 2013); Catherine Lutz, Homefront: A Military City and the American Twentieth Century (Boston: Beacon Press, 2002); Catherine Lutz, “Making War at Home in the US: Militarization and the Current Crisis,” American Anthropologist 104, no. 3 (2002): 723–735; Cynthia Enloe, Nimo’s War, Emma’s War: Making Feminist Sense of the Iraq War (Berkeley: University of California Press, 2010); The Network of Concerned Anthropologists, The Counter-Counterinsurgency Manual (Chicago: Prickly Paradigm Press, 2009); R. Brian Ferguson, The State, Identity and Violence: Political Disintegration in the Post-Cold War World (New York and London: Routledge, 2002); R. Brian Ferguson, “Ten Points on War,” Alisse Waterston, ed., An Anthropology of War: Views from the Frontline (New York: Berghahn Books, 2009): 32–49. (6) Fenda A. Akiwumi, “Global Incorporation and Local Conflict: Sierra Leonean Mining Regions,” Antipode 44, issue 3 (2012): 581–600; Bette Denich. “Dismembering Yugoslavia: Nationalist Ideologies and the Symbolic Revival of Genocide,” American Ethnologist 21, no. 2 (1994): 367–390; Mariane Ferme, The Underneath of Things: Violence, History, and the Everyday in Sierra Leone (Berkeley: University of Cali- fornia Press, 2001); Daniel Hoffman, “Violence, Just in Time: War and Work in Contemporary West Africa,” Cultural Anthropology 26, no. 1 (2011): 34–57; Mahmood Mamdami, “Good Muslim, Bad Muslim: A Political Perspective on Culture and Terrorism,” American Anthropologist 104, no. 3 (2002): 766–775; Stephen Reyna, “Global Warring Today: Maybe Somebody Needs to Explain,” Alisse Waterston, ed., An Anthropology of War: Views from the Frontline (New York: Berghahn Books, 2009): 50–70; Nazif M. Sharani. “War, Factionalism, and the State in Afghanistan,” American Anthropologist 104, no. 3 (2002): 715–722. (9) See for example, R. Brian Ferguson, “Pinker’s List: Exaggerating Prehistoric War Mortality,” Douglas P. Fry, ed., War, Peace, and Human Nature: The Convergence of Evolutionary and Cultural Views (New York: Oxford University Press, 2013): 112–131; Douglas P. Fry, “Peace in Our Time,” BookForum Dec/Jan 2012. http://www .bookforum.com/inprint/018_04/8575 (accessed November 8, 2014); Edward S. Herman and David Peterson, “Steven Pinker on the Alleged Decline of Violence,” Dissident Voice December 5, 2012. http://dissidentvoice.org/2012/12/steven -pinker-on-the-alleged-decline-of-violence/ (accessed November 8, 2014). (10) Catherine Lutz, “The Military Normal,” The Network of Concerned Anthropologists, eds., The Counter-Counterinsurgency Manual (Chicago: Prickly Paradigm Press, 2009): 23–37. Alisse Waterston is professor of anthropology at John Jay College of Criminal Justice, City University of New York and president-elect of the American Anthropological Association. She is author of the intimate ethnography, My Father’s Wars: Migration, Memory, and the Violence of a Century and two ethnographies on urban poverty in the United States, Love, Sorrow and Rage: Destitute Women in a Manhattan Residence and Street Addicts in the Political Economy. She has also published the collections Anthropology off the Shelf: Anthropologists on Writing, co-edited with Maria D. Vesperi, and An Anthropology of War: Views from the Frontline. Waterston is an International Scholar of the Open Society Institute, affiliated with the Institute for Gender Studies at Tbilisi State University. Sebastian Junger is an author, journalist and documentary filmmaker who lives in New York City. His books include The Perfect Storm and, most recently, War. Restrepo, a documentary that he shot, produced and directed with journalist Tim Hetherington, was nominated for an Academy Award in 2011. (Hetherington was killed in combat two months later.) Junger reported on war and foreign affairs for Vanity Fair for over a decade, until Hetherington’s death precipitated a decision to turn his attention to other subjects. The Last Patrol is his first documentary on a domestic topic. This entry was posted in Selected Print and tagged dialogue, documentary film, Film, Margaret Mead Film Festival, Media, war. This dialogue between Sebastian Junger and Alisse Waterston, researchers and reporters from different but complementary traditions, is so important for helping to involve all of us in conversations about what it has meant to be a nation at war. Waterston’s response that to acknowledge and recognize the character of the rhetoric of war and heroism is to be in solidarity with the young men who go to war — what calls them and what impels them — is crucial. If we accept this rhetoric without question, we risk shutting off conversations that cross lines of gender, social class, military and civilian that could help us to more fully understand this decade in our national and global history. It also opens the discussion to the others who are affected by war as family members and friends of military personnel, military personnel who serve far from the front lines, those with the power to commit the nation to war, and the vast majority of US citizens who may feel very distant from the war and its effects.